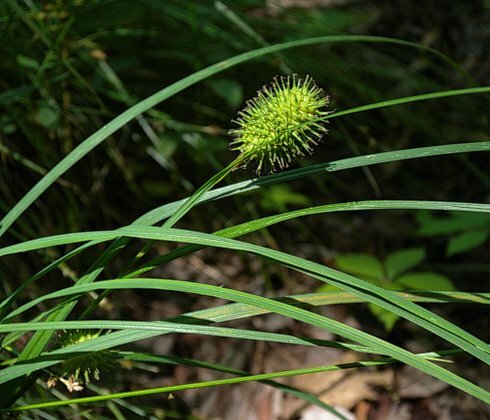 Carex squarrosa.John Hilty.illinoiswildflowers.info (Accessed 8/30/2016). Carex squarrosa is a perennial sedge, 30-90 cm tall, stout, densely tufted, stems sharply 3-sided. Leaves bladeless at base of stem; upper leaves 0.3-0.6 cm wide, elongate, well distributed along stem, ligule at top of sheath much longer than wide; inflorescence bracts slender, slightly longer than flowering stem. Flower spikes usually solitary, 1-3 cm long, 1-5 cm wide, male flowers at base, upper portion female, rounded, scales of perigynia concealed; perigynia crowded, beaks sticking outward, making spike appear prickly, body inflated 0.4-0.6 cm long, beak 0.2-0.3 cm, 2-toothed, achene slender with a persistent, bent style; blooms and fruits June-Sept.
Habitat: Wet woods, meadows, often in calcareous soils.